This program is about fishing but it is also an exploration of people, places, cultures and heritage. It is part travelogue, part documentary, part natural history, part sport fishing. These constituent parts are coherently woven together through local interview, anecdotal storytelling and stunning, high value photography. Come along with us as we take cameras to the Canadian Arctic, Australia, India, Africa, Ireland, Scandinavia and all over the US in search of a giant predatory fish, the legends, the history and the people that surround them. The USP of this show will be the dynamic and unique camaraderie between Denis Isbister from Nevada and Alan Broderick from Ireland, two accomplished fishermen on the cutting edge of their sport and both with a genuine ability to portray that passion. 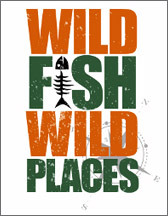 Wild Fish Wild Places guarantees to offer mesmerizing viewing experiences through natural history, stunning locations, sublime photography and huge fish. We will put you in the hearts and minds of people that live to fish and people that fish to live.